Loving this site http://www.polyvore.com you make sets of outfits that you like! Using the clothing on the site or you can download your own and post them for the world to see Ive only just started using it tonight and its quite great at busting unwanted boredom. My Profile is also there. 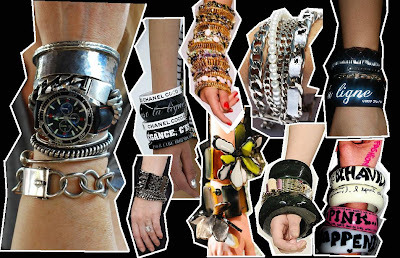 I love the whole wearing lots of bracelets and bangles heaps of them! So many its like lifting weights especially with watches just looks so awesome! Op-shopping is my new thing...i'm sick of going out and seeing people in the same clothing as me so Ive decided to buy old used clothing from extremely cheap thrift shops. No more retail stores. so starting from last week i'm not allowed to buy any clothing from retail stores. Shoes are allowed tho (ew wearing old shoes...). 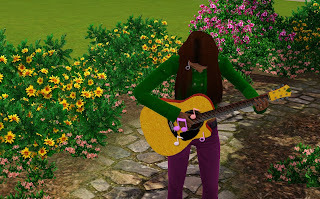 Obsessed with Sims3 so very very addicted! This is my favourite sim her name is Amelie and she is married to James and they just had their first child Abigale! i plan on make their family huge! !